R.E.M. with Peter H - MTV Unplugged 1991, etc. Tell me please, can it be? 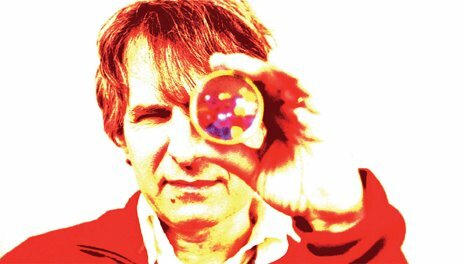 Chris Stamey is looking through a kaleidoscope. No wonder he gave a similar title to one of the songs he composed for The dB’s new album, Falling off the Sky. He and his band mates seem to know instinctively that you don’t reach the ripe age of 50-something — after experiencing everything they have, separately and together, musically and otherwise — without it shaping and coloring your perspective. 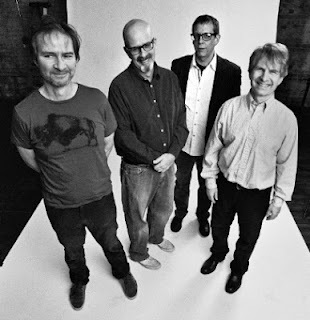 The dB’s have decided not to pretend they’re exactly the same people or musicians they were when they made their last album together — three decades ago. And the music they’ve now created is all the richer for it. Falling Off the Sky is an immensely satisfying collection of alternative pop music. It beguiles you, it draws you in, and sounds better and better the more you hear it. These poor slobs slaved away in the dead of winter to create a great summer pop album for you. As with all great bands, there’s some mysterious X-factor at work here. Call it “musical group chemistry” if you like. 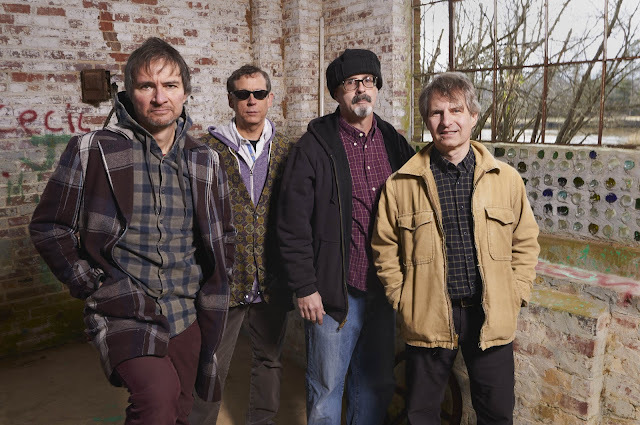 Or you can adopt Peter’s explanation — the “shared hallucinogenic background” of a band that grew up together in Winston-Salem, N.C. Whatever it is, this extraordinary something makes Falling Off the Sky a far greater achievement than the mere sum of its parts. Not to worry. 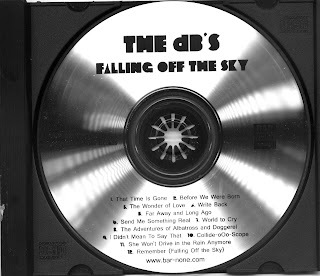 Some seven years in the making, Falling Off the Sky assures everyone that The dB’s sterling reputation remains unblemished. Really, “unblemished” isn’t the right word. 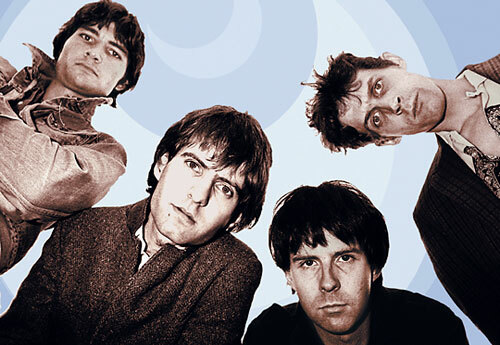 FOtS not only preserves, but extends and improves the group’s well-deserved legacy as creators of uniquely wonderful music. Is the new album “jangle pop”? Is it 1980s “New Wave”? Or, to use my preferred term, is it masterful “alt-pop” music? In the end, it doesn’t matter. FOtS transcends whatever category you might choose. As I told Peter when I interviewed him recently, FOtS sounds to me like it’s sequenced as an old-fashioned LP. The A-side is a great collection of singles. And the B-side? It’s a stone-cold masterpiece, a six-song sequence that deserves to be savored in its entirety. Years from now, I predict discerning music lovers will rank the second half of FOtS up there with other all-time classic rock and pop albums. It’s that draw-droppingly good. 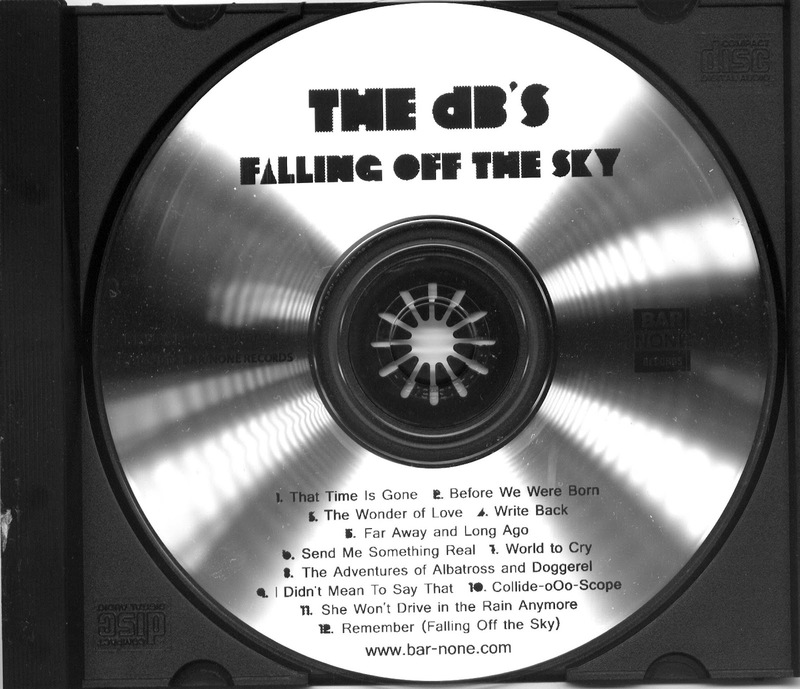 By now, you’ve heard the lead track, “That Time Is Gone.” It borrows heavily from the garage rock The dB’s knew and loved growing up, with combo organ, bluesy guitar riffs, and a maniacal drummer firing on all cylinders. Lyrically, it’s classic pop music fodder: the guy is trying to forget the woman who keeps occupying rent-free space in his head. 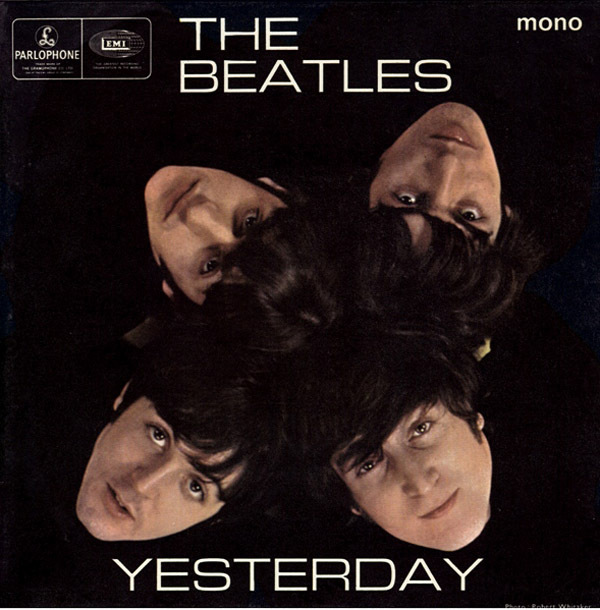 Thus, the gotta-getta-hold-of-myself refrain: “You’d better wake up, wake up, wake up — that time is gone.” This Holsapple-penned song announces two things to the listening public: first, the new album is not going to replicate 1980s jangle pop, but use whatever type of music that best serves the songs. Second, the past really is over and done. As much as we might yearn nostalgically for that woman, that vintage musical sound, or our youthful past, this album is about refusing to be “stuck in the 1982s,” to quote a character from Napoleon Dynamite. "What'd you call this one, Chris? Such a determination doesn’t mean, however, that there’s no point in reflecting on the past. In a nutshell, this is the lyrical tension at the heart of these songs: how can a person remember and reflect without falling into a time warp? Is there a way to dream about the past and still stay awake in the here and now? Track 2 is Chris Stamey’s “Before We Were Born” — a song that’s musically more buoyant and thematically rosier than its predecessor. In his joy, the singer revels in the idea that he and his love knew each other “before we were born.” The music itself is straight-no-chaser pop rock, done to perfection. 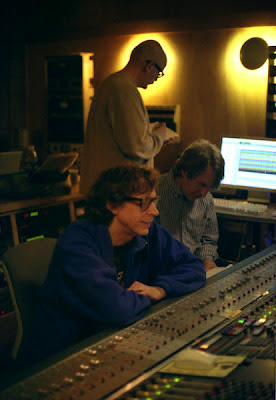 Mitch Easter, longtime friend of the band and unnamed “fifth member” of The dB’s, shines here on electric guitar as he does on several other tracks. Will: "No; it's called a knuckleball!" On Track 4, drummer Will Rigby finally gets his own star turn with “Write Back.” Even though he’s been writing and recording music for years, this is the first dB’s song that’s truly his. And it’s a stunner, featuring a great fusion of countrypolitan and pop music. It features appropriately amazing drumming and a Jackson Pollack-esque organ solo*, also courtesy of Will. The song has an intriguingly clever lyric, filled with ambivalence about the narrator’s fateful decision to not write back to his ex love: “I never replied to your reply to my reply to your reply to my reply to your reply to my letter.” If you fall prey to Mr. Rigby’s musical charms here, hurry over to his Bandcamp site and help yourself to the many other musical treasures you can find there. By Track 5, the spotlight turns back to Chris. As another reviewer has already noted, “Far Away and Long Ago” leans heavily on the classically-inclined chamber pop of The Beatles' “Yesterday.” Musically and lyrically, it’s an audacious move. Fortunately for us, Chris has everything required to pull it off, to great effect. His vocal performance strikes a bittersweet balance between wistful remembrance of a past, lost love and rueful recrimination. Musically, he manages to unashamedly incorporate Lennon, McCartney & Martin’s best without making it sound like a Beatles knock-off. “Far Away and Long Ago” also demonstrates the breadth of Chris’ musicianship (did you know he’s also a trumpeter and cellist?). 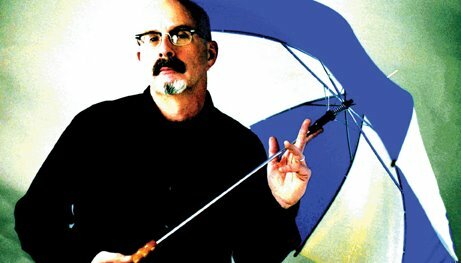 Here and elsewhere on the album, his expert use of string players from North Carolina (some from the chamber folk group Lost In the Trees) provides a sonic depth missing on most other pop albums. Nearly halfway through, now, and Falling Off the Sky is only starting to hit its stride. Track 6, “Send Me Something Real” incorporates all the strengths named above: gorgeous melody, Holsapple-Stamey harmonies, tasteful instrumental flourishes that enhance the song (flute and strings in this case), and words that manage to be honest without falling into cynicism. 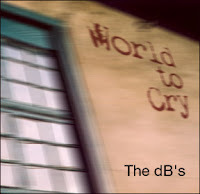 “Send me something real,” sings Chris, “ ‘cuz I don’t remember how it feels / To be free and pure / And I’ve got to find that door.” The track revels in the musical dynamics that set The dB’s apart from their peers. There’s a pause at the 3½-minute mark that makes you think it’s time for the AM radio fadeout. But then a smidgen of backwards guitar announces “hang on a second” — followed by 75 seconds of pure dB’s bliss, as the four friends sing, strum, pluck and pound away, delightfully lost in the music. The world should hear "World to Cry"
How much more needs to be said about Track 7, “World to Cry”? What a song; what an arrangement; what great playing! Why can’t we live in a world in which this song gets played all over the radio and climbs to its rightful place, high in the pop charts?!? I don’t know. But this much I do know: it’s one of the catchiest pop songs I’ve heard since … since the last dB’s record. And it’s the perfect song to launch “Side B” of the album. With Track 8, Falling Off the Sky starts to get pretty weird — in the best, most surprising sense of the word. 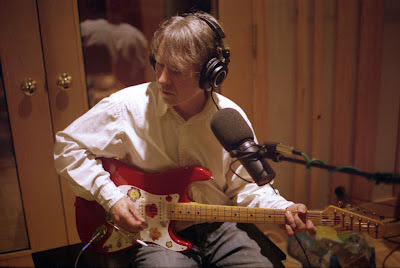 Chris composed and arranged two songs in the second half of the album with several things in common. 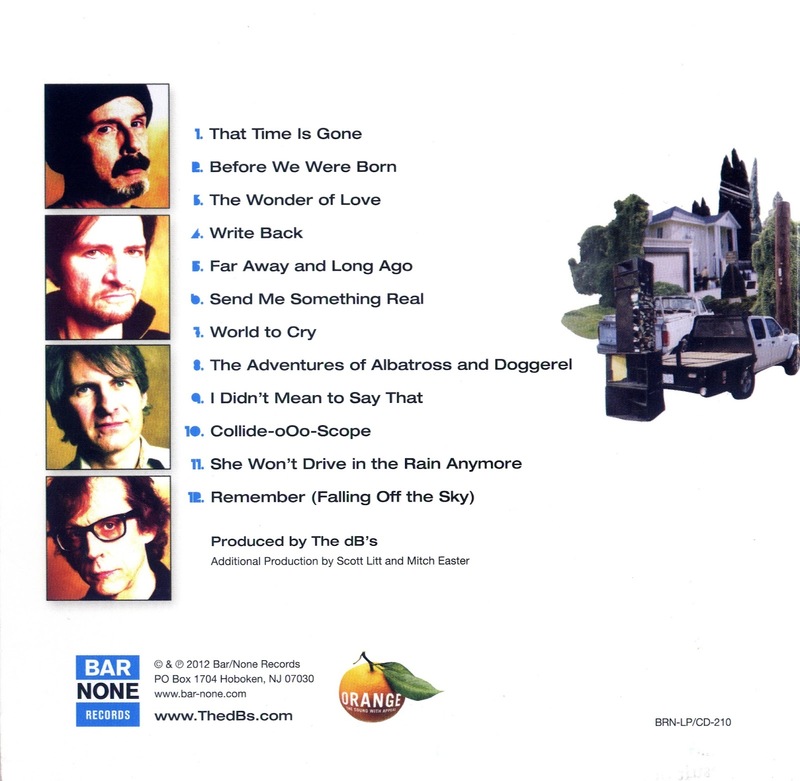 “The Adventures of Albatross and Doggerel” and “Collide-oOo-Scope” (Track 10) both have two protagonists, non-linear lyrics, and a mixture of music that’s head-spinningly uncategorizable. One might venture to say they’re pop-prog-psych-rock. But that doesn’t begin to suggest how outlandishly good they are. It’s as if Chris decided, “I don’t care if anyone understands or likes these songs; I’m going to write and arrange these for our enjoyment. If anyone else digs them, so be it.” I hope he does it a lot more often. Chris, recording songs to please himself & band mates — thank God! Track 9 is Peter’s “I Didn’t Mean to Say That.” It starts off sounding like an apology in ballad form, but gets more interesting as it reaches the refrain, “So what are we to do? / If only we knew / Oh, I didn’t mean to say that.” To be sure, the mid-tempo song is about forgiveness. The singer/narrator humbly explains to his beloved: “I didn’t mean to call you off / I didn’t mean to call you down / Or out, or anything / Anything.” But it also explores the awkward thought that comes after an apology: OK, what happens now? I don’t think the younger, 1980s-era dB’s would have come up with a song like this. It’s mature, it’s wise — and for those who know what Peter's talking about — it hits pretty close to the bone. Take a bow, guys. The album's amazing. Track 10 is “Collide-oOo-Scope,” the second of Chris’ pop-prog-psych-rock tracks. It begins as a sing-along nursery rhyme, “…singing hidey-hidey hey.” Moments later, however, strummed acoustic guitars give way to a clatter of drums, the swell of strings, and the thump of an electric bass. In a few minutes, the song grows in musical complexity until the listener has no freaking idea what he or she is hearing. Which, I might add, is a very cool and all-too-uncommon experience for most pop music listeners. She won't. But, then again, that's what he's here for. 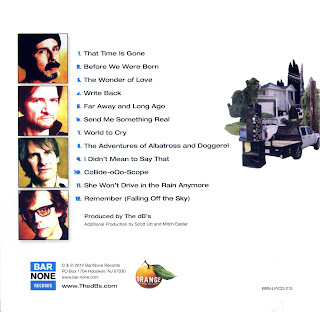 Finally, we come to Track 12, “Remember (Falling Off the Sky)” — the song that pretty much had to close the album. On first listen, it sounds like a litany of memories set to a pretty, straight-ahead rock tune. Give it a few more spins, though, and you might start hearing something else: a meditation on memory, mortality and the finality of death — accompanied by an upbeat, energetically-played melody. "You gotta use these to appreciate the low end!" Whatever’s it’s actually about (and I bet Chris isn’t telling), the music has a nice twist at the 2-minute mark. I’ve never heard an album’s final song actually speed up midway through, but that’s exactly what “Remember” does. It’s as if the four dB’s are trying to tell us, Age-wise, we may getting long in the tooth; but musically, we’ve never had more fun. So maybe we’ll just keep on playing. *Will’s organ solo in “Write Back,” as described by Chris.